the digging trips. 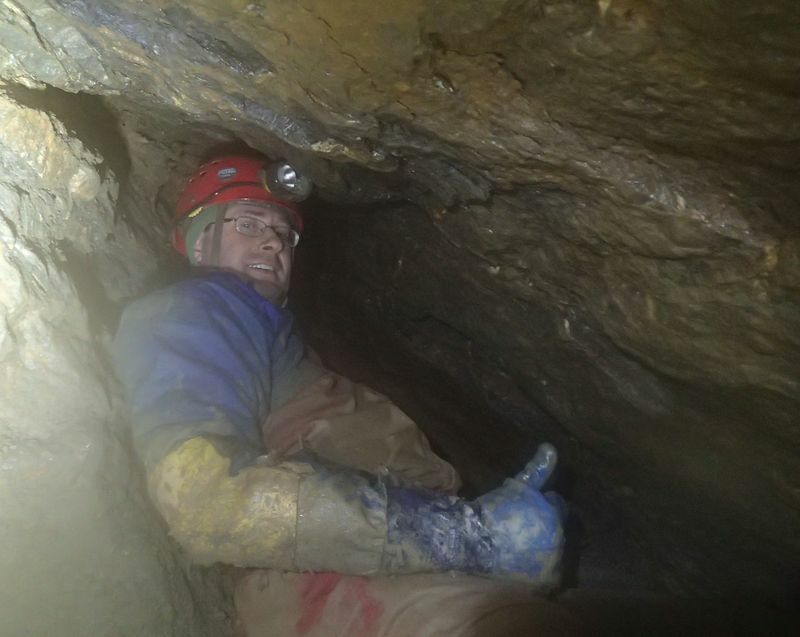 Jake was keen for some caving between Christmas and New Year, but it did not happen to the New Year. We met up around Jake's for Coffee- myself and Steve arriving in Scott's car, and Pete arriving in an awesome 4 wheel drive. The weather - the wind, the rain, floods had reduced the turn out - but we were a good size for visiting the dig. Swildon's was in flood or pretty much so, and there had been much talk about whether to cancel at the last moment. But we were going to play it one step at a time. Rain was predicted just before midday and then was meant to stop. Well we would not see it - but the water levels as we went in and out were pretty similar - high and frisky. Everyone but Jake was in a wet suit plus oversuit. I came to regret not having elbow pads. 50 metres. 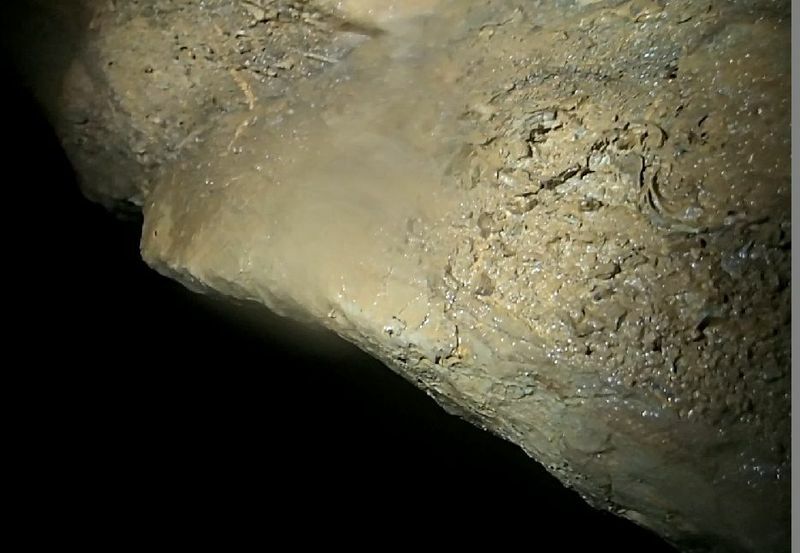 The dig itself is around 20 metres long. We dug another 2 metres. more because these days the sump feels narrower than I remember it. We entered the streamway and I was immediately impressed by its power. Pete and Jake and seen it higher but I had not, and Scott and Steve had seen it worse, but they had stayed above the waterfall under the old forty. We followed the short dry way which was in full flow, to the confluence of the wet and dry ways. The shower bath immediately after was awesome, Jake contrived to avoid it and climbed high. I was battered by the water. The stream was in powerful flow, foaming down towards the waterfall under the old forty. I nervously descended - trying to keep out of the water, but unable to see the usual footsteps. I was afraid the water would take my foot away when I put it into the water, eventually I sat down on the lip for a quick soaking. The power of the water was immense on the climb back up, but climbing out was easier for me. Scott did an interesting climb up on the right, whereas I used the step and handle on the left. the twin pots, whilst I narrowly hung on. Jake and Pete did it with ease. On the way out when climbing the twin pots the water nearly stole one of my wellies twice. I stopped halfway up the waterfall to put it on again! Eek! As we went on descent of the usual waterfalls were much more difficult than usual and our progress was slow even by my standards. It was all very exhilarating. We reached sump 1. Jake made the plan of sending Pete through first and then pushing all the bags through tied together. I was sceptical but it worked a treat. The water pushed them through beautifully, I was not so sure it would be so easy on the way back. But it was. My turn was uneventful - my chest was constricted briefly but I was through quickly enough. On the return Jake and Scott complained of large pebbles or small rocks blocking the sump, but they had cleared it out before my turn. We floated down to our right turn and took a wet crawl and clambered up to the bottom of the 10 foot climb. I was not feeling brave and did not wish either to use just the fixed rope nor demonstrate my poor climbing skills. So we used our ladder which made it easy. The black hole itself has recently been rebolted with eco-resin-bolts (Thanks to Andrew). We were initially puzzled by the lack of a y-hang but the single bolt and what we thought was the backup or traverse bolt made a rather good y-hang. We also found there was a bolt on the ledge just down for a descent down black hole itself. On our return we also spotted but did not use the two new bolts on the far side. 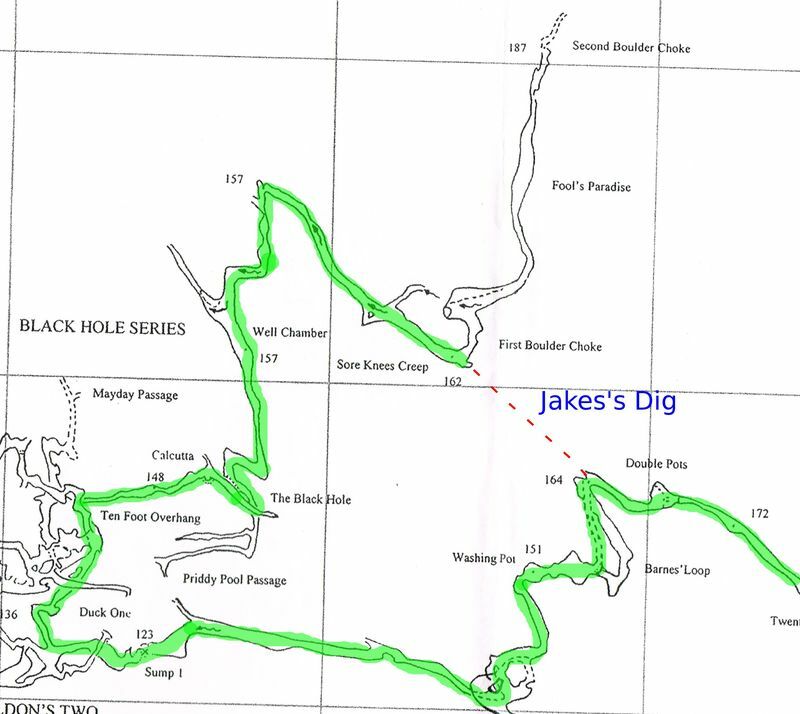 Jake abseiled down and rigged a traverse line across black hole. We also rigged a lifeline. The traverse line takes the bold part out of the final bold step because you have a line to pull on and can put your cows tails into a loop as soon as you are on the far side. Good system. We crossed without issue. After lunch we began digging. Scott and Pete were at the coal face, I was at the base camp the halfway point for our hauling, and Steve and Jake were stacking rocks into a dry stone wall adding to Jake's existing master piece. We worked to past 4 o'clock. I managed to topple the container we were hauling rocks three times, which was a pain because you had to do the crawl to repack the rocks. The trick is slow gradual stready pulls. I am better now. But Scott was not too happy with my performance as the container toppled nearer his end and so he re-filled twice to my once whereas I crawled more but it was my fault. Scott explained how he carefully packed the container so it was balanced - when I refilled I just stuffed it in. Hmm the joys of digging - not something I know about. Here are some photos I took of the dig. The view down the streamway from the start of the crawl to where we were stacking the rocks into a dry stone wall. This view shows the extent of the dry stone walling from Jake's previous digging trips. Rocks are now being stacked quite a distance from the dig. Scott and Steve stacking rocks in Jake's dry stone wall. The view up the streamway towards the start of the dig from where we were stacking the rocks. Jake at the end of the dig. Jake pointing the way on - to a narrow slit that continues another 7 metres at least. streamway is impressive and there are special formations on the way to Jake's Dig. I would also have liked pictures crossing the black hole. I was lifelining on the way out and was not thinking about photos on the way back. The real star of this trip was the Swildons streamway - awesome but frightening. I have never concentrated and contrived so much to avoid the streamway before in Swildons. I did not enjoy my drowning like experience on the twenty where I was battered by the water. 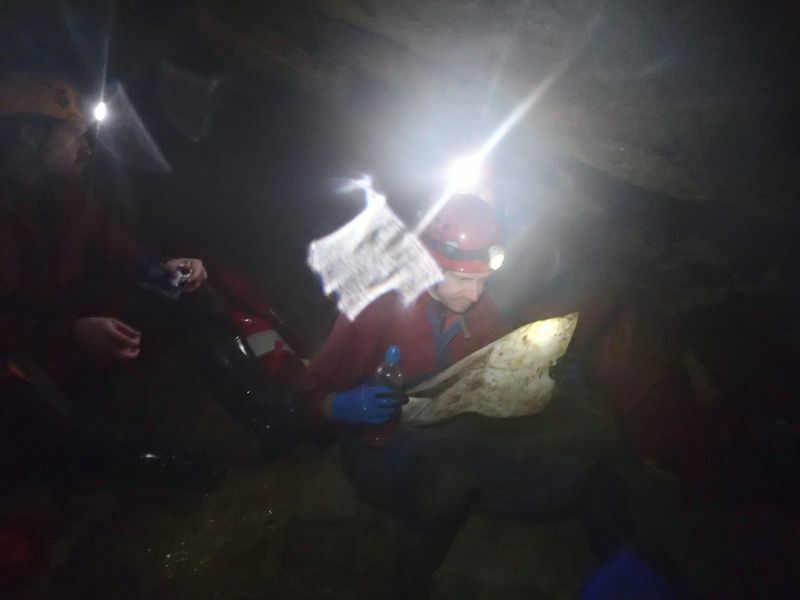 I am keen to do some more digging trips with Jake and Pete, but would prefer more sedate weather conditions. Good trip and a good project - a lot of digging is still needed but at least we know where it is going and when it should end. It is a cross club or open dig and everyone is welcome. We ended up in the Hunters for a pint and food where I was toasted by the fire, as I realised I was rather cold. Excellent report Dave, that sums it up nicely! I was pretty knackered on the way out trying to haul that bloody bag around, but it was a superb trip. I enjoyed the digging and will be back... Thanks goes to Jake for inviting us along. Good luck to Jake with this. What a superb new variation this would create, as a new round trip or a variation of the ever-popular Short Round Trip. The Swildon's 1 end (above the start of Barne's Loop) was dug back in the 90s by Wessex members. Would it be worth resurrecting this? Mr Williams, weren't you on that? How was it left? Been liaising with Jake for some time now. I was gutted there were only four bags. Perhaps we should not have put the ladder in your bag. But there again I was knackered with no bag. Great report and photos Dave. As my first digging (read "stone wall building") experience this was good fun, albeit a fair amount of that enjoyment was being in the streamway in those conditions. The dig itself was a rewarding experience though and there was good camaraderie. Jake's enthusiasm for it is infectuous. Hopefully with a bunch more days like that we can make some more significant progress. It would be one hell of a connection to make. Was also great to have a look at Fools Paradise, an expected but awesome stretch of Swildon's. That was certainly good fun roaming around the Old Approach passages, but I wouldn't fancy the climb up to get there from the streamway. Perhaps someone could put a bolt at the top, that would make a nice little round trip with an abseil down to the streamway. Those muddy tubes certainly made our return an energetic undertaking. If you are referring to the original route and the climb from the main streamway there is an excellent thread belay just before the step across into Approach Passage. No bolt required. Sounds like an excellent dig. It would certainly encourage more visits to Black Hole series and perhaps inspire further digging in Fool's Paradise. I would have thought digging it from the Barnes Loop end would be easier but there may be spoil dumping issues I don't know about. Just the sort of thing the forum needs. Photos, survey, report -- the lot. Keep it up. The climb up is OK, coming back out of the tube into the stream way (cos you don't know any better) is alarming but certainly do-able. If I could do it, anyone should be able to.